Beer and fried food – it may be an American cliché but as the superbowl approaches, it’s hard to resist this game-time tradition. Fried calamari has become a favorite restaurant appetizer. It’s often sandwiched between wings and mozzarella sticks on restaurant and pub menus. 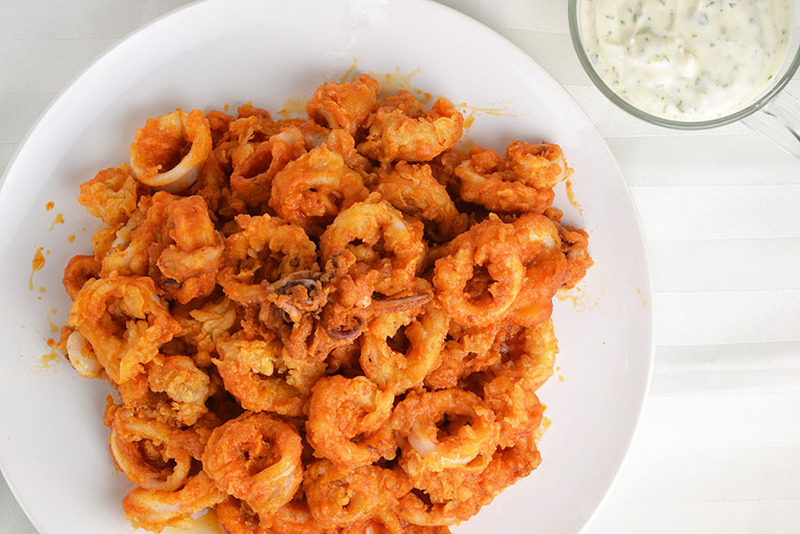 This buffalo fried calamari with ranch dip recipe combines the best of classic buffalo wings and traditional fried calamari to make one spicy indulgent party appetizer. Of all the recipes on my site, Fried Calamari with Two Dipping Sauces remains one of the most popular (yes I’m surprised too since I barely knew how to use a camera back then). So when I had buffalo fried calamari at a popular pizza restaurant, I was inspired. I wanted this dish to have a fresh and clean taste so I was determined to make each component from scratch. Somehow this makes me feel healthier when consuming a gazillion calories (the superbowl counts as a special occasion, right?). Of course, making everything from scratch isn’t necessary but I love adding fresh herbs to homemade ranch dressing (you can use blue cheese dip if you prefer) and having the ability to control the heat and spiciness of the buffalo sauce. Unlike the heavy beer batter I’ve used previously to coat the calamari, I opted for a light flour coating to offset the additional layer the buffalo sauce adds. I simply marinated the cleaned cut squid in buttermilk for extra tenderness and coated it in lightly salted flour. After frying, the squid remains tender with a light crunch and can be easily tossed in the buffalo sauce. Eat while still hot and dip in the cool creamy ranch dip. The fried tender calamari with the heat of the spicy buffalo sauce and refreshing garlicky ranch dip is a dangerously tasty combination that’s sure to distract you from the game. Make the ranch dip and the buffalo sauce. Combine garlic paste, sour cream, and mayo in a medium size mixing bowl. Stir in buttermilk, lemon juice, and Worcestershire. Mix in scallions, parsley, basil (if using), salt and pepper, and hot sauce. Chill and serve cold. Melt butter with whole garlic clove in a small saucepan over medium-low heat. Whisk in hot sauce. Bring to a simmer. Whisk in vinegar, Worcestershire, onion, powder, garlic powder, and cayenne powder. Remove garlic clove. Keep warm until ready to use. Clean and cut squid in rings. Place in a large bowl. Pour enough buttermilk in the bowl to cover the squid. Cover and chill for 1 hour. Pour flour and salt into a shallow dish or pie plate. Drain calamari and toss in flour to coat. Heat 2-3 inches of oil in a dutch oven or large heavy pot to 375 degrees. Carefully add the squid to the oil. Fry until just lightly golden, about 1-2 minutes. Remove with a slotted spoon and drain on paper towels. 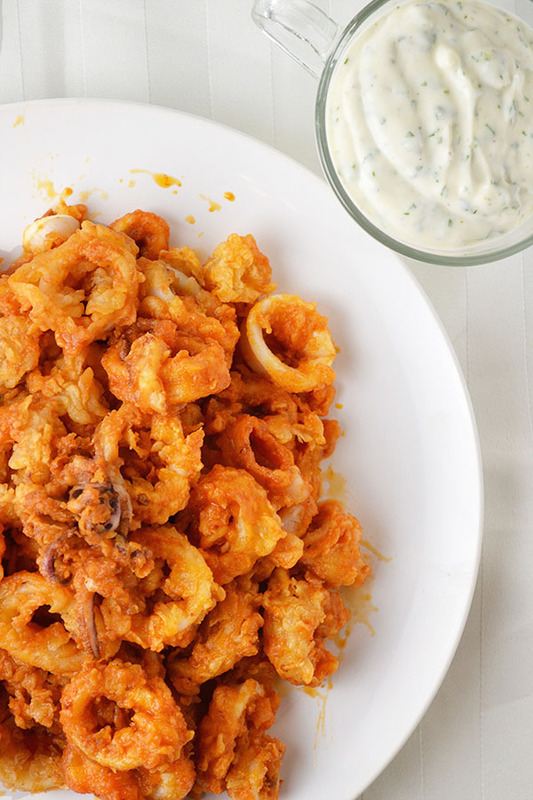 Place calamari in a clean bowl and lightly toss with buffalo sauce until just barely coated. Transfer to another bowl or plate and serve with ranch dip for dipping.